After the stupendous response to the recreated version of #GuruRandhawa’s High Rated Gabru, and #TereNaalNachna the makers hit another high with #MummyKasam as the song has garnered massive 10 Million hits in no time! Nawabzaade is an upcoming romantic comedy film starring Raghav Juyal, Punit Pathak and Dharmesh Yelande in leading roles and also features Varun Dhawan, Shraddha Kapoor, Badshah and Athiya Shetty as a special appearance in the songs. 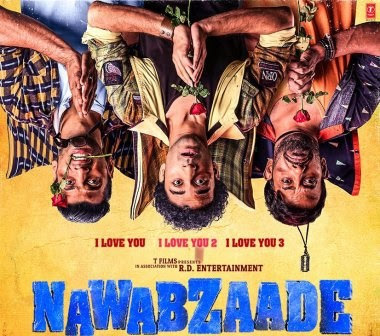 Talking about the trailer, Nawabzaade is a vibrant, romantic comedy about three male friends who try to woo the same girl, often giving rise to hilarious situations, with baddies also gunning for the same girl. Veteran actors like Vijay Raaz and Mukesh Tiwari support the main cast in adding a mean twist to the plot. Actor Zakir Hussain would also be seen in an important role in the film. The film will be released on 27 July 2018.